Buy Mi 5 from Amazon.in for Rs.24999 now! The Mi 5 is the flagship device from Xiaomi which was released in April 2016. The phone was available in Mi.com only, which was disappointing for some users. The problem with mi.com was that they didn’t have delivery to everywhere in India. Some states like Kerala wasn’t covered under their delivery. Not only that, there return and replacement policies of mi.com wasn’t much appreciated by users. So there was always people waiting for the Mi 5 to be sold on other e-commerce sites Flipkart and Amazon. 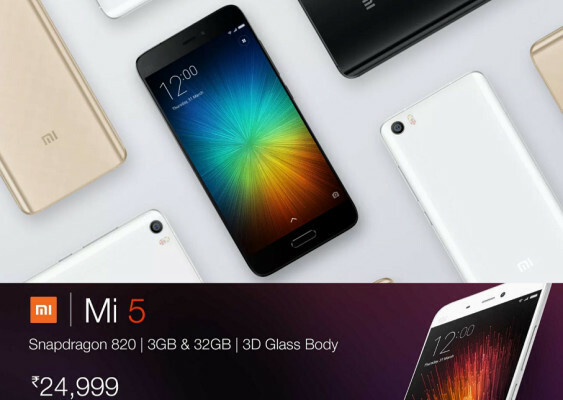 Recently Xiaomi made the Mi5 available in Amazon. You can buy the device from Amazon. Since Amazon is a trusted e-commerce site having good return and refund policies and since cloud-tail is the seller selling Mi5, you can blindly go ahead and buy the phone. A really great gadget to have under 25k. Just bought ine for my wife.